Tell me what sessions interest you the most, and I’ll try to report on them. You can find a complete list of sessions here. Take a few moments to read the list and seminar descriptions. Then, comment below and tell me which sessions interest you the most. I’ll be at the Conference and will report on the sessions I attend. I’ll plan on attending those sessions of greatest interest to my readers. That way, you’ll be able to benefit for the AFP Conference even if you can’t attend. Have you ever stumbled upon a brilliant fundraising idea that inspired you to say, “I wish I’d thought of that!”? Some of the greatest tactics and strategies we will implement during our careers are ideas that originated with others. 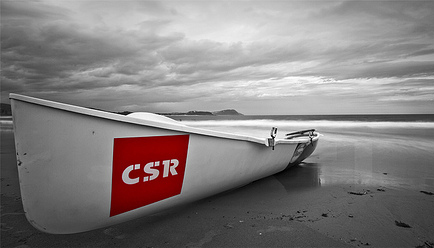 Fundraising and nonprofit management ideas surround us. The challenge is not that there is a shortage of ideas; the challenge is knowing which ideas are truly great. IWITOT is a unique seminar that will be moderated by Ken Burnett, Founder of SOFII, and involve 16 top-notch fundraising professionals who will each have up to seven-minutes to present his/her IWITOT brilliant idea. The fundraising ideas must be those the presenters admire or envy — an innovative replicable idea that we can all learn from. The proviso is that the idea cannot be their own or from their own organization, says Burnett. Stephen Pidgeon, Stephen Pidgeon Ltd.
Bernard Ross Reveals the Next Big Thing in Fundraising! 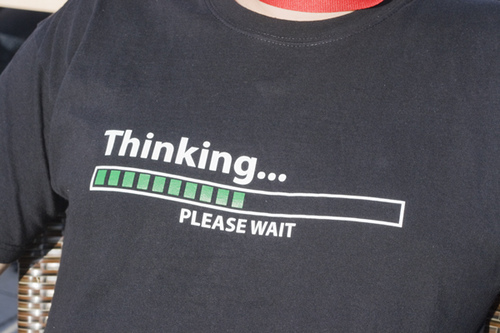 Have you ever wondered what your donors are thinking? Life would be so much simpler if you could read their minds. Now, we’re actually a step closer to knowing. 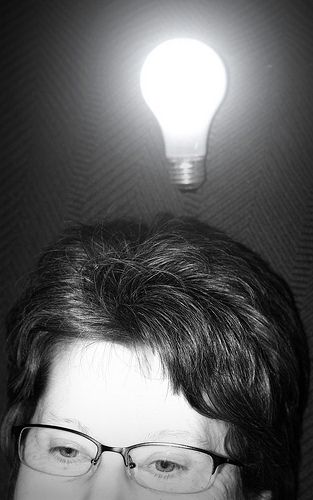 To understand what your donors are thinking, you first need to understand how they think. That’s where veteran consultant and author Bernard Ross, Director of The Management Centre, and fundraising consultant Alan R. Hutson, Jr., Principal and Managing Partner of The Monument Group, can help. In a preview of their session “Behavioural Economics: Everything You Know about Donor Decision Making is Wrong” at the AFP International Fundraising Conference (Baltimore, March 29-31, 2015), Ross told me the duo will show attendees how they can apply the work of Dr. Daniel Kahneman, author of the bestseller Thinking, Fast and Slow, to better understand their prospects and donors and, thereby, enhance their fundraising efforts. Kahneman, a psychologist who won the Nobel Prize in Economic Sciences, says we have two complementary processes by which we make decisions in life, including fundraising decisions. He refers to these as System 1 and System 2. System 1 operates automatically and quickly, like an autopilot. System 2 allocates attention to effortful, conscious mental activities. We think System 2 is at work most of the time; however, Kahneman has found it is, in fact, System 1. Ross observes that most fundraising professionals think donors are making rational judgments when they are not. Think of the old sales axiom: “People buy based on emotion then justify, after the fact, with logic.” A similar process is often involved with philanthropic decision-making. Donors make philanthropic decisions based on six to eight key mental heuristics — or System 1 short cuts — that we all use. Ross says that fundraisers can learn these heuristics and use them to transform response rates, gift sizes, and more. In their session, Hutson and Ross will introduce participants to these key heuristics and show them how that knowledge is being used to remarkable effect by charities around the world. If you’re like most fundraising professionals, you make three costly mistakes whenever you meet with prospects and donors. That insight comes from Robert Fogal, PhD, ACFRE, CAP, Founder and Principal of Fogal Associates and creator of StyleWise™. Below, Fogal identifies those three common mistakes and shares his ideas for how you can avoid making them. In addition, Fogal will share further advice in his seminar “Achieving Effective Interpersonal Relations: How to Lead Others by Managing Ourselves” at the AFP International Fundraising Conference (Baltimore, March 29-31, 2015). If you can’t make it to the AFP Conference, you can purchase a recording of the session following the Conference. Fogal will also lead a Spring 2015 Program involving two six-hour workshops and five one-hour individual coaching sessions to help fundraising professionals benefit from the StyleWise™ system. The StyleWise™ Program balances conceptual learning with practical application so you can be “wise” about knowing and using your “style” of personality. Fogal designed the Program to help you more effectively motivate donors. You can learn more about The StyleWise™ Program by clicking here. Most organizations, however, no longer allow employees to learn primarily through hard knocks. It takes too much time, and is too costly. Yet, we all know (supposedly) that effective relationships, which take time, lead to the gifts most meaningful to both the donor and the organization. 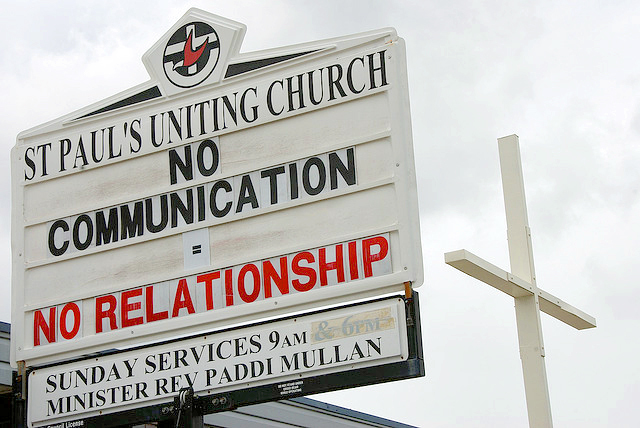 So, caught in a difficult situation, we too often commit cardinal errors in relationship building. 1. We don’t listen very carefully to prospects because we talk too much. We’ve known for decades how easy it is to overwhelm someone in a conversation — especially when we’re nervous or stressed, or super enthusiastic. The old saw is true — the person who talks the least is the one who manages the conversation. But, more important than controlling the conversation is the reality that when we talk too much, we communicate that what the other person has to say isn’t important. I am acquainted with some fundraisers who rightfully advocate how the case for support is central to successful fundraising. Their problem, however, is that they overwhelm prospects by reciting the case — the whole thing, sometimes — in their eagerness to interpret their causes. This leads me to the second mistake. Want a FREE Book? How about 2 FREE Books? From time to time, I come across truly special offers that I’m pleased to share with you. 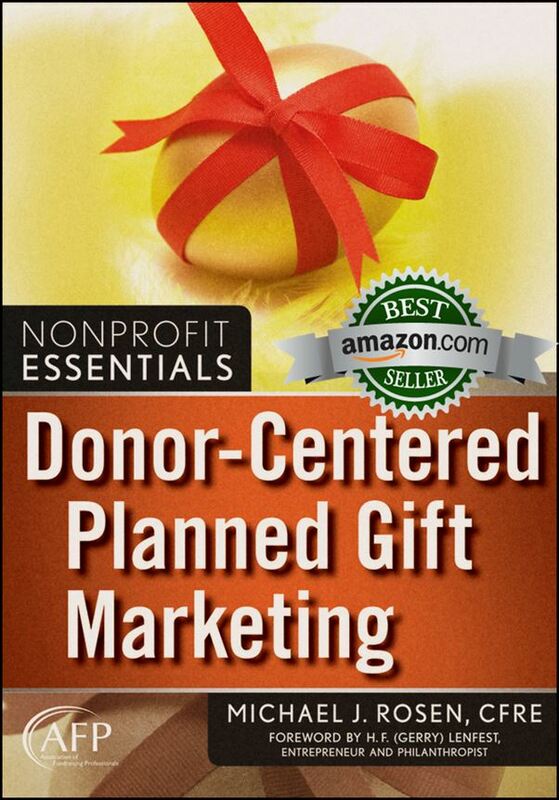 This textbook is written specifically for fundraisers or financial advisors seeking to expand their knowledge about charitable gift planning. 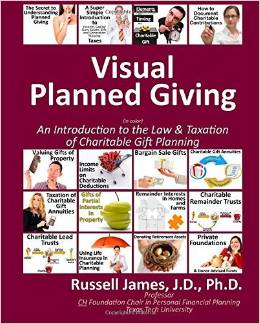 This introductory book addresses all of the major topics in planned giving law and taxation and features over 1,000 full-color illustrations and images that guide you through complex concepts in a visual and intuitive way. Distilled from his years of teaching Charitable Gift Planning at the undergraduate and graduate levels, James makes this topic accessible and enjoyable for the busy professional. The paperback version of this book retails for $187.98. However, you can get the electronic version for FREE thanks to my friends at MarketSmart, just click here. This book provides an extensive review of the changing nature of American charitable estate planning from 1992-2012 and includes over 50 charts and graphs. James presents information in a simple, visual fashion with each page containing a graph or chart, comments on the importance of the information, and details about the methodology behind the data. Much of the information presented comes from a long-running, nationally-representative, longitudinal survey including information about the final estate distributions from over 10,000 survey respondents who have died during the study. Now that I’ve saved you a bundle of money, I’d like to suggest some books you can purchase that will inspire and help you achieve greater results. When you make your purchase, usually at a discount, at The Nonprofit Bookstore (powered by Amazon), a portion of every sale will be donated to charity. Stephen Pidgeon: What’s Holding Back Your Legacy Fundraising? 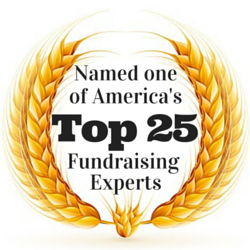 What is one of the major things holding back your legacy fundraising efforts? So, why does Pidgeon think many fundraising professionals are naïve? Because THEY don’t like to thin k about death, [fundraising professionals] assume everyone else is the same. Well, older people (those in their late 50’s and older) do think about death, and they do it perfectly maturely and with no fuss. And the older they get the more unexceptional it becomes. Indeed, supporters are often hugely grateful for the opportunity to make such a major contribution, albeit after they have died. It is a matter of immense pride to them that they have made the decision and sorted their affairs.